There are countless water activities to try out while in Destin, but one of the top is undoubtedly snorkeling. Whether you're new to snorkeling or you've done it thousands of times in the past, Destin offers a great range of snorkeling sites for you to check out. Learn more about the top spots to snorkel, what you should know beforehand, and where to grab snorkeling equipment if you need it. If you or someone in your group is new to snorkeling, it’s helpful to know a little more about it before you fit it into your vacation plans for Destin. Snorkeling is like the little brother or sister to scuba diving, and is a great option for those who want to view marine life from closer to the surface of the water. In order to snorkel, you'll really only need a snorkel and a mask. If you want, you can also wear flippers, which can help you swim a little faster and use less energy. Snorkeling is a fun pastime for anyone who is already a comfortable swimmer. While you won't be heading deep underwater, you can swim easily right on the surface and check out the wonderful marine life below. Technically, you can snorkel anywhere that there is water with no restricted areas. However, what most people are hoping to see are the fish and underwater life that make the sea interesting. For that reason, gravitating to spots with sea grass or underwater structures is smart. These areas are typically the spots where fish feel protected and can feed, which means more opportunities for you to see them while snorkeling. There are countless places surrounding Destin where you can snorkel. The grass flats by the Coast Guard station near Crab Island is an excellent place to snorkel. Sea grass is plentiful along the shoreline. 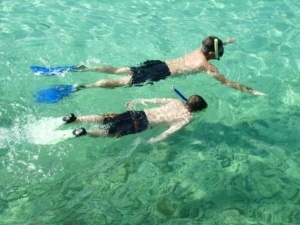 The sandy bottom and the shallow water makes it ideal for beginners who are just getting used to the idea of snorkeling. Not only is this spot fantastic for getting the hang of breathing through a snorkel in a safe environment, it is also home to lots of crabs, seahorses, and small fish. Near the Destin Pass, you'll also find the Destin jetties. These jetties are arguably the best spot for snorkeling in Destin. The east jetties, in particular, are packed with underwater life. This area, too, is suitable for snorkelers of all abilities. In some spots, the water is just a few feet deep. In other areas, it can be up to 55 feet deep, which makes this more interesting for experienced snorkelers and swimmers. If you want to get to several snorkeling spots at once, having a pontoon boat is ideal. If one spot gets crowded, you can pull up anchor and head to a more secluded spot. If visibility is poor or the tide is too low, just boat along until you reach an even better snorkeling destination! If you have your own snorkel gear, bring it to Destin! Having your own equipment that you're familiar with can be a great advantage when snorkeling in Destin. Thankfully, there are also several options for renting snorkeling gear in Destin. Many hotels and resorts in the Destin area, as well as bed and breakfast and vacation rentals, will actually lend you snorkel gear. Otherwise, you can rent gear from one of the shops right on the HarborWalk and other vendors near the shoreline. A pontoon boat charter in Destin is the ultimate way to get to the best places to snorkel, visit Crab Island, and explore all that Destin has to offer. Double Fun Watersports has the best pontoon boats in town with two decks and two waterslides off the top deck. So, grab up to 12 of your closest friends, your snorkeling gear, and hop on your own double-decker pontoon to create an adventure you'll never forget!